Immigrant Parents Rely On Kids For Help Online The digital divide separates those who have access to technology from those who don't. But there's another digital divide that has gotten less attention: Those who don't speak English are often ill-equipped to navigate the online world, even when they have good access to it. Kids are helping their parents bridge that gap. 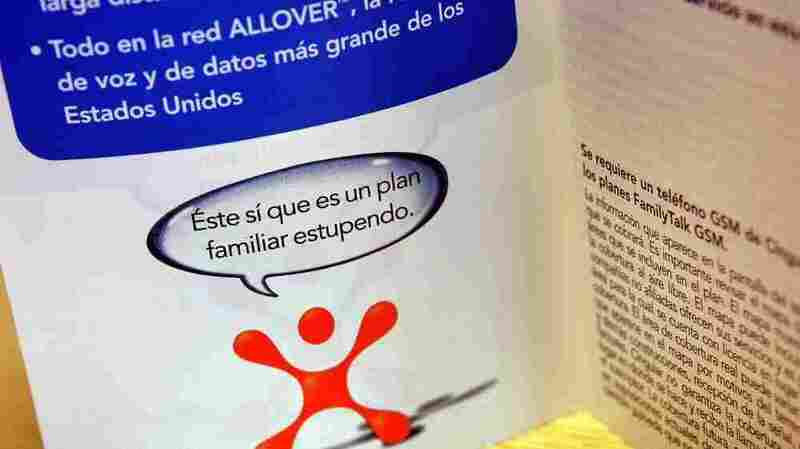 A Spanish-language pamphlet for Cingular phone-rate information is displayed in a Cingular store in Elmhurst, Ill. Cingular announced in 2006 that it was converting 420 of its stores to "a bilingual concept," with both English and Spanish phone information and payment options, and bilingual staff members. On a weekend in East Los Angeles, kids do what they do anywhere else — play games, hang out in restaurants. But in this immigrant neighborhood, many of them have grown-up responsibilities. Fifteen-year-old Gonzalo Cruz says his parents depend on him for help online. "When they need to look up a place, like a doctor's appointment, I show them," Cruz says. "Computers right now, in our country, they're just English. You have to use them a certain way, and they didn't learn to do that when they were little." Thirteen-year-old Cassandra Flores helps her parents pay bills online. "Yeah, a lot of kids from school do the same thing," Flores says. "It fills a very important role because you're helping your parents with a lot of work and [the stress] of understanding." Of course, it's not unusual for younger generations to help adults with strange and challenging new technology. But when you add in the language barrier, that help becomes a crucial family responsibility. Vikki Katz, a professor at Rutgers University, has studied the way immigrant kids help their parents with technology. "A lot of the resources immigrant families need the most are online, and sometimes they are only online," Katz says — things like visa forms and school applications and important everyday things, too, like finding a local business. A Spanish speaker in Los Angeles looking for an orthopedist might go to Google.com and type in "oficina ortopedista Los Angeles." The top result is in Madrid. "There's no excuse for us not doing a better job with this," says Trystan Upstill, an engineer at Google. Upstill says this is a problem all over the world. There are a lot of Turkish speakers in Germany, for example, who have a hard time finding what they need. But right now, if you search in Spanish, it's difficult for Google to guess that you want an orthopedist in the U.S. Upstill says to determine that, Google needs to deal with mind-bogglingly high numbers of combinations. "It's quite clear that you have to build very scalable algorithms to not just deal with native language speakers in a particular country," Upstill says. "It's a difficult problem and we're always looking at how we can do a better job here." For now, it falls to bilingual kids to pick up the slack. On a Saturday at the Perez household near Los Angeles, Pedro Perez has asked his 17-year-old son to look up information on the soccer player Lionel Messi. Pedro looks over his son Victor's shoulder as Victor reads aloud from his smartphone. Victor helps his dad, and mom Violeta, with everything online, from finding job forms to finding local stores and news. "When we need to see something in the Internet," says Violeta Perez, "he finds it. When we go somewhere, he finds the directions. When we have to go to work, we have to get there fast. He also helps us with the business with the house that we rent." It can be a lot of responsibility for a teenager. But helping out online is just an extension of what immigrant kids have long done. Recently, Victor was on his way to a party when his Mom received some important information about their home. "I had to take her to the lawyer that's handling what we had to do, and I just didn't go," Perez says. "I stayed with her. I didn't really mind, because our family is more important than a party." Victor's parents have access to the Internet in their home, and they can afford computers. But until they can use those devices the same way English speakers can, kids like Victor will be closing the language divide — and the digital divide, too.